Ped Egg – for better or worse? Last winter my mom bought me a Ped Egg and since I was wearing boots most of the time, I did not need it. Come summer, I’ve been walking the hell out of my feet. I used this for the first time a few weeks ago and it’s amazing. Last night I even used it on my boyfriend and he loved it. I know, you’re thinking that the grater-ish bottom looks like it hurts, but it feel really good actually. Try it out for yourself! How much pink is too pink? Ever since pink became more of a trend than a mere way to support the breast cancer cause, people all over have been capitalizing on this new phenomenon. I, for one, have been a huge supported of the color pink since I can remember and because more and more companies have pink items, I’m thrilled. But how much pink (in and out of your kitchen) is too much? Where do you draw the line if you live with a guy? I live with my boyfriend, but I still can’t help buying things like the above, or pink coffee makers, etc! I’ve been way into cooking for quite some time, and every birthday I get cooking supplies…most PINK because that’s my favorite color for gadgets and acccessories. This birthday I got these pink oven gloves. My first thought was that they are too fluffy to be practical, but after 2 months of using them, they are the best. Here’s why – they are super soft, very very heat resistent (which oven gloves should be) and best of all, they have individual fingers for easy handling! 1. 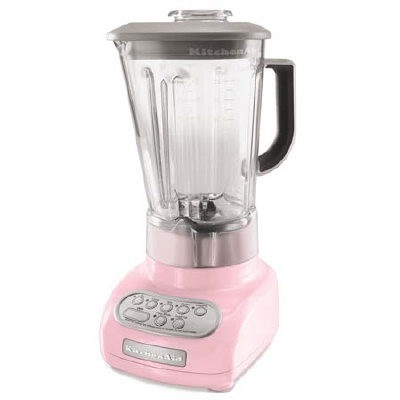 Pink Blender: For drinks, sauces, soups, smoothies – you name it. You gotta have a blender! 2. 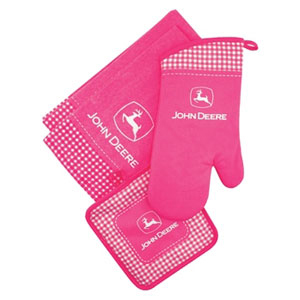 Pink pot holders / dish towels: Apparantly John Deere likes pink too. And these are not really gadgets, more of a kitchen staple. Who cares? They still make my list! 3. 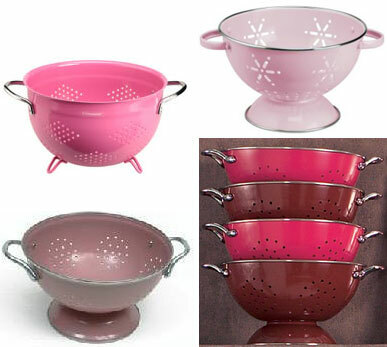 Pink Strainers: Not only are they a great pink color, but they have very stylish designs on it! 4. 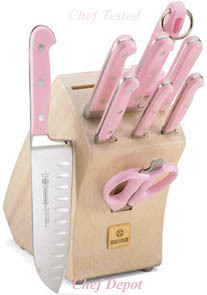 Pink Knife Set: It’s not just one knife – it’s a whole freakin’ knife set. Who knew cutting could be so glamorous? 5. 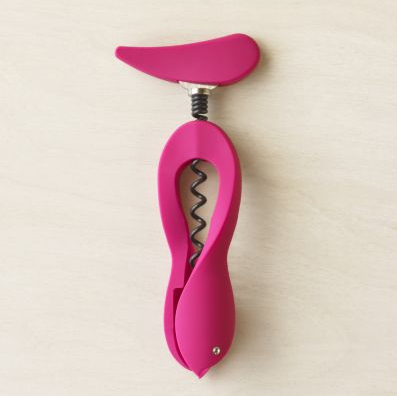 Pink Wine Opener: How do you open your pink wine? With a pink wine opener! Just kidding, I hope you don’t drink pink wine…. 6. 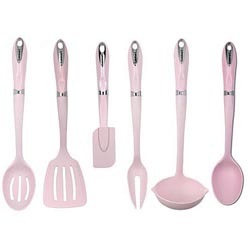 Pink Cooking Utensils: Yesss…. more pink! 7. Pink Stove: What to cook on? 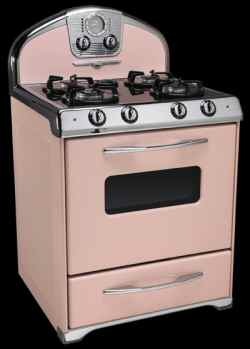 A vintage pink stove! I’m in love – where do I find one? 8. 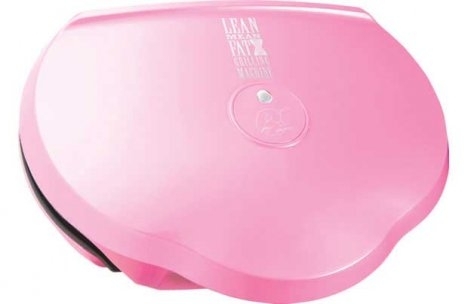 Pink George Foreman Grill – an essential in every household. 8. 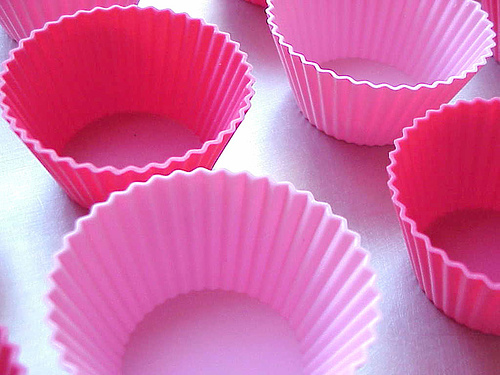 Pink Cupcake Liners: What a perfect accessory to your next baking party. 9. 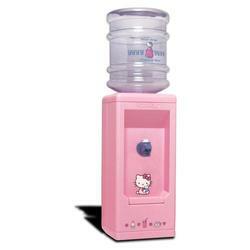 Pink Water Dispenser: Need Water? Why not make it a cuter dispenser than the generic ones? 10. 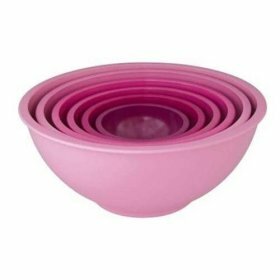 Pink Mixing Bowls: So many bowls that you can use them for soup, salad, mixing – anything! Well this weekend was awesome. I didn’t go out at night and I didn’t really do much of anything – no cab rides, expensive dinners, or late night cab rides. FYI, my boyfriend wasn’t in town and I didn’t really feel like braving the cold at night by myself. I did, however manage to frugally spend a good deal of cash. And by frugally, I mean…. I hit the jackpot. Here’s how I did it. I went shopping at American Eagle on Saturday afternoon. I love this store because it’s so fun and summery and they have such cute “hanging out” clothes and beach clothes. I know I don’t live near a beach, but a girl can still purchase, right? This is what i bought. How cute is this set? I am a sucker for pink and hearts and well I’ve been drooling over this cute set for ages. Everytime I went into American Eagle, I would ALMOST buy it, but just didn’t. Then it went on sale when I was out of town and when I went back in, my size was gone. Luckily I bought it online and got a 20% savings using a discount coupon code. (Just google “store name discount coupon code” and you can always find savings). Also, the bra is on sale online but not in the store. This is why I love shopping online. I also bought these shorts which are only available online. Cute for hanging out at the beach, cute for walking around and super fun! Another reason why I love online shopping. They come in dark blue… but the yellow are much more fun! 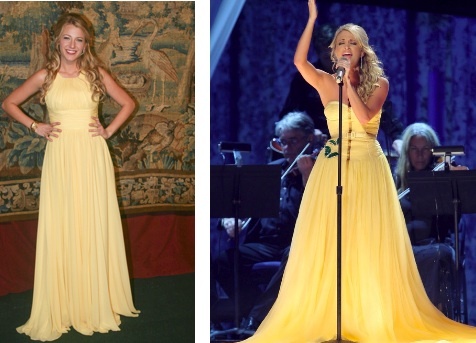 Let me tell you how lucky I was with this dress. I was browsing through Forever21 on 34th street and I spotted this dress that was misplaced on the first floor amongst the madness that is Forever21. I quickly grabbed it up because its so adorable and then I looked at the price tag -$13.50. YES folks, that’s cheaper than some cabs in New York. Hell, that’s cheaper than a bagel at Murray’s Bagel Shop on 6th Ave. So I search for a size small somewhere in the store and see what other colors this comes in. Turns out that the section that they house these dresses in was closed for the day (WTF??). I decided to take my chances and try it on. Jackpot. It fit perfectly… and that’s how I got a bargain. Yup, we all know that I had an iPhone. If you don’t, now you do. I lost it in a cab. I’m over it now (really!) and I have an awesome Blackberry Pearl and I do admit, I love LOVE LOVE brickbreaker, but alas, its time to move on and I want the red Blackberry Curve (hey! I’m picky, but I’m just being honest!). Well that is until I saw this…..pink iPhone. 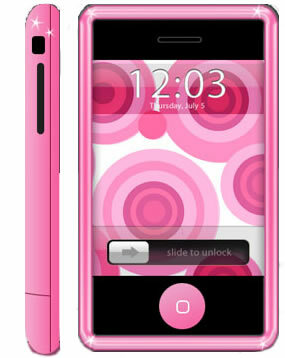 I know its totally photoshopped, but wouldn’t it be cool if they actually had a pink iPhone!? I love my laptop. 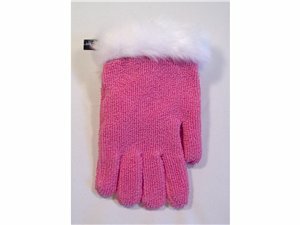 It’s pink, cute and very useful. I don’t travel with it that much, but on the occasion I’ll work from home or go out of town. I’m leaving for California tomorrow and I just realized that I don’t have a laptop bag. So i searched and searched yesterday with no avail to find a cheap, but good bag. Needless to say, the cheapest bag I found was $60 bucks, which I’ll probably have to break down and buy today. Only because I love my laptop so much! This one below is made by Puma… probably pretty pricey, but looks similar to the $60 bag i saw yesterday. Yes! It’s pink! WOOHOO. 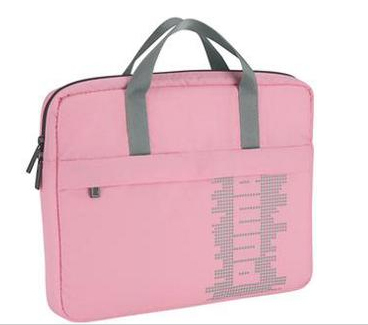 If you’re looking to spend more bucks, check out Acme – they have some stylish and durable laptop bags and they come in a ton of wonderful colors! Also, Etsy has some great laptop bags, and they are all handmade – so support indie artists! 1. The Pink DVD Player: Why buy a silver or black DVD player when you can buy a pink one from NextPlay? They are SO adorable and cheap. Unfortunately when I bought my DVD player, I called all over to find one and they were all sold out. If you get one, let me know… you’re a lucky lucky person. 2. The Pink Casio Exilim: So far, I only have a pink case for my camera. It’s also a 4.0 megapixel (meaning it’s ANCIENT). I want to upgrade to this one this year….. WOOHOO. 3. The Pink iPod Shuffle (exclusive to Walmart): And sold out, I might add. If you can’t get your hands on this, get a pink cover. Though, let me add – It’s just not as cool. 4. The Pink Tool Set: Your husband or boyfriend has a tool kit, so why shouldn’t you? And if you’re going to have to do the heavy dirty work around the house, you should be using something cute. End of story. 5. The Pink PS2: We all know that the PS2 is amazing, for the mere fact that you can play Guitar Hero on it…. and as of November, it’s coming out in PINK. Hallelujah! 6. The Pink KitchenAid: I love to cook and I love to cook on pink appliances. Amazing. 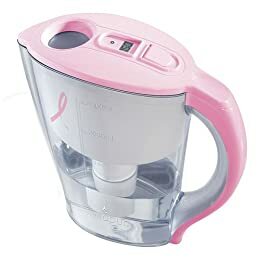 Though I have pink pots and pans, a pink kettle and other small appliances, this one takes the cake! 7. The Pink George Foreman: Did George approve this? Maybe he created it for his daughter… oh wait, he had all boys. Well, then my friend, George, must be looking out for the ladies on this one. 9. Pink Dyson Vacuum Cleaner: I love to clean. And now, I love to clean even more! The generic yellow vacuum cleaners are so tacky. Women out there, you should only agree to vacuum if your husband’s buy you a pink vacuum cleaner. 10. The Pink Coffeemaker: I was torn between the pink coffeemaker and the pink toaster. Then I realized that I drink WAY more coffee… and you probably do too, which is why this coffeemaker made the cut. Recently I’ve been hearing that orange is the new red. I’m not sure who decided this… in fact, i thought that pink was still the color of the season. Ok maybe that’s just because pink happens to be my favorite color. 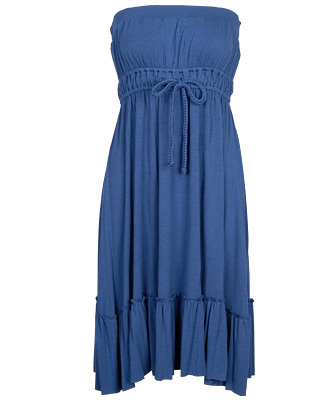 Anyway, i’m not all that opposed to orange where I see dresses like this. Not too bold, not subtle at all, but bright and fun!